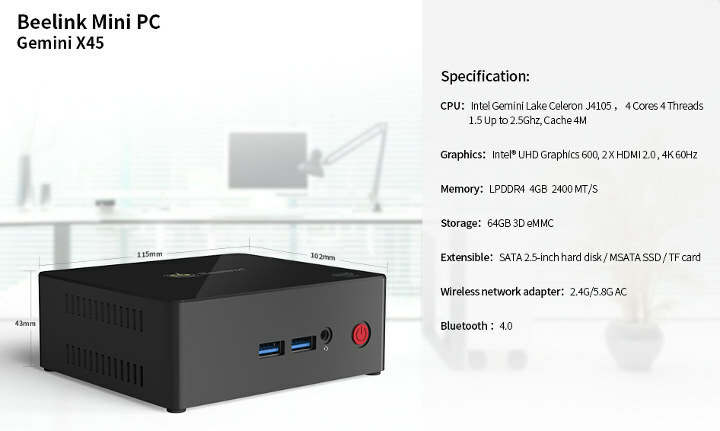 The Beelink X45 mini PC is now available, and Lightinthebox.com have provided a unit for review. 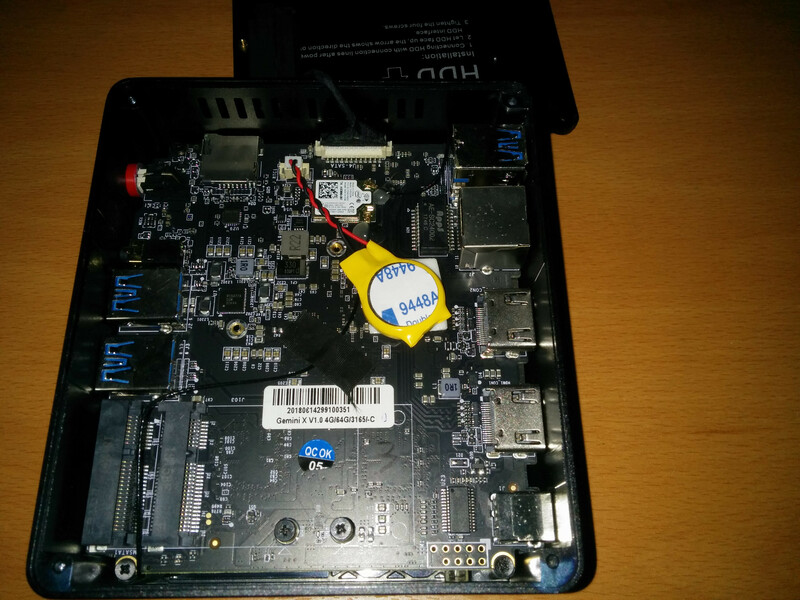 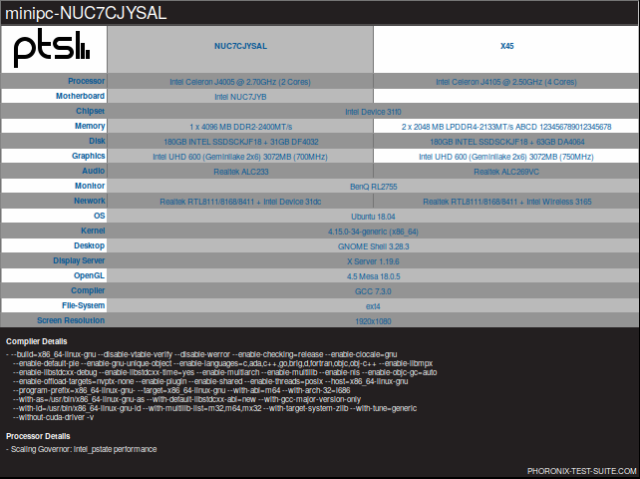 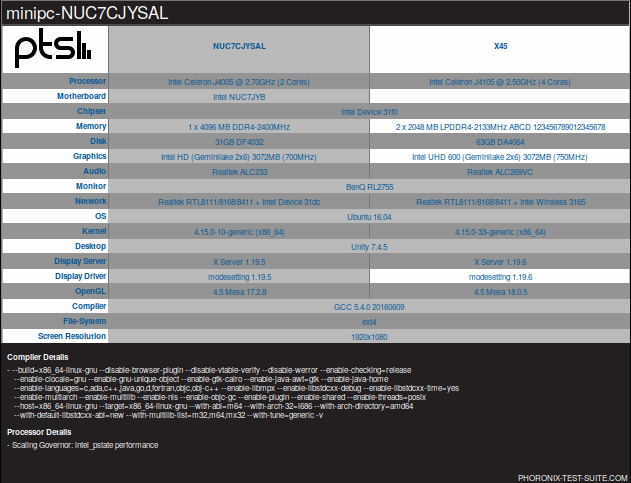 It is very similar in style to Intel’s latest NUC Windows mini PC, the NUC7CJYSAL reviewed earlier. 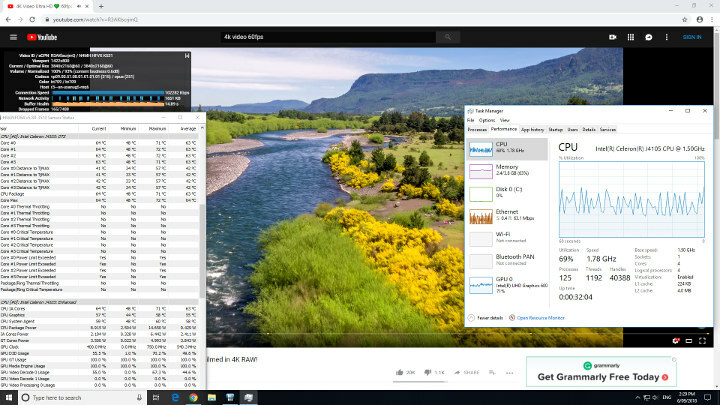 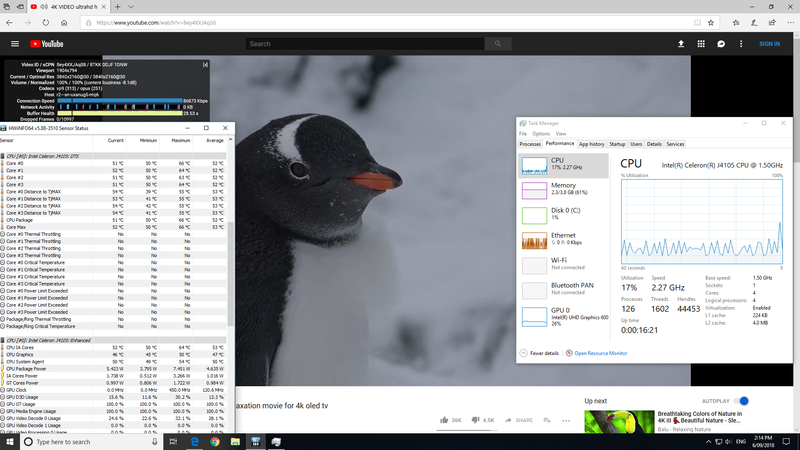 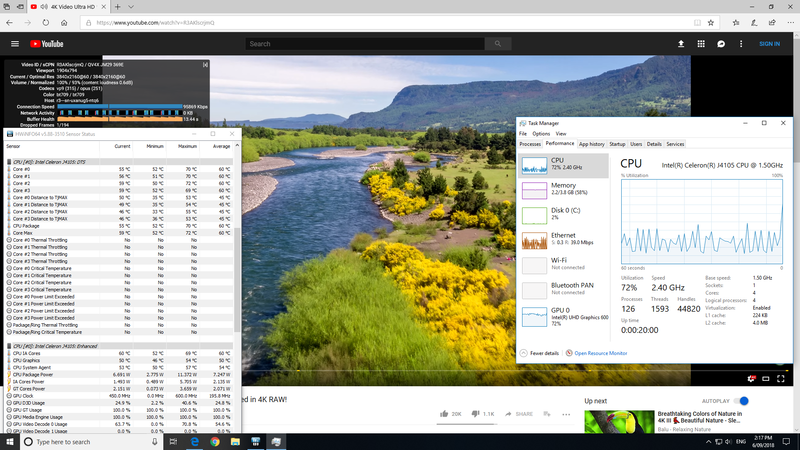 However it contains an Intel Celeron Processor J4105 SoC which is a quad core processor bursting up to 2.50 GHz together with the Intel UHD Graphics 600 processor that is capable of 4K support at 60Hz. 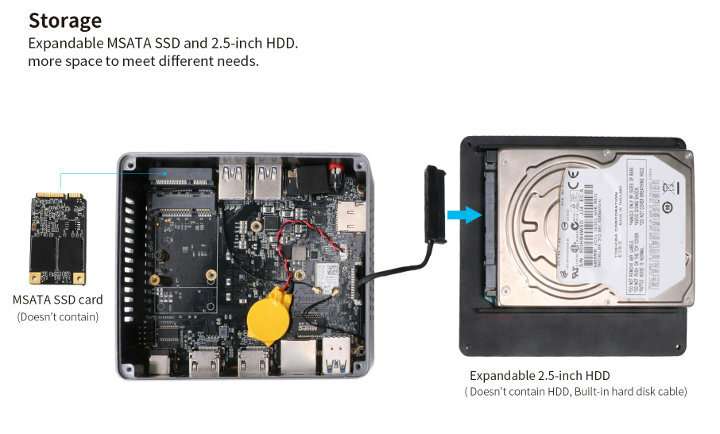 A key point to note is the Beelink X45 comes with 64GB eMMC with pre-installed Windows 10 Home together with 4GB DDR4 RAM (soldered and is non-expandable) with space and connectors for both an mSATA and SSD. 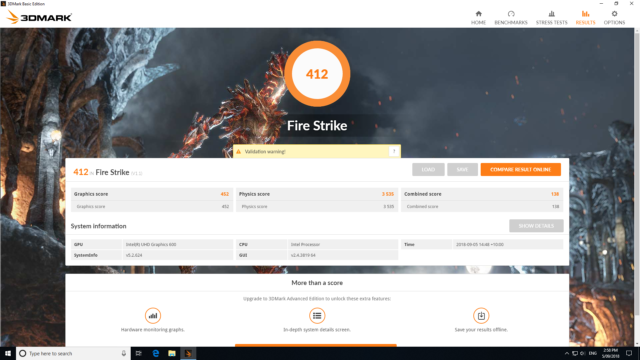 Broadly speaking however the Beelink X45 performance is similar or better than the earlier J4005 device, especially with the CPU comparisons where its quad cores out perform the dual core processor. 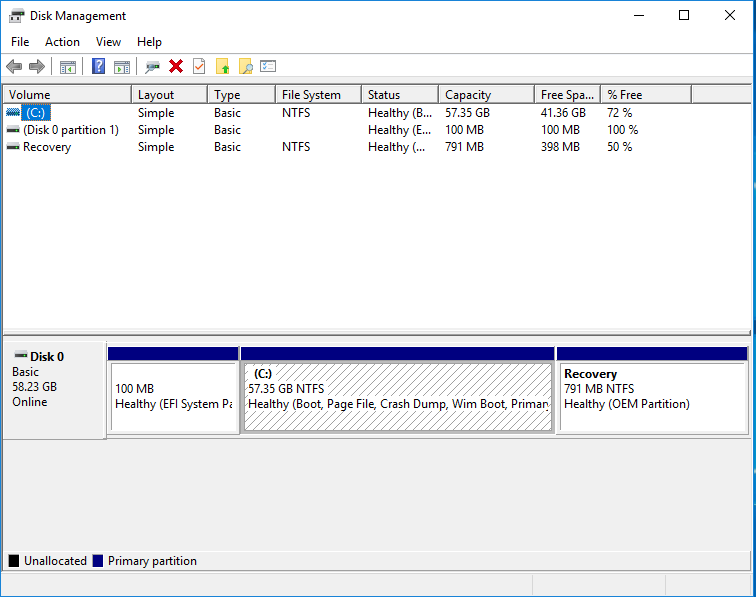 Next I shrunk the Windows partition and created new a 15GB partition so I could install and dual boot Ubuntu using an Ubuntu 16.04.5 LTS ISO. 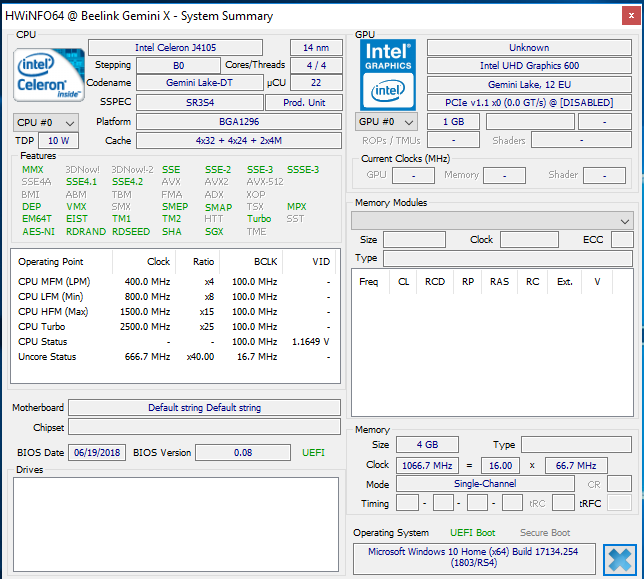 linuxium@X45:~$ dmesg | grep "MMC card"
Note that the memory is 2133 MHz and not the advertised 2400 MHz. The results highlight that the key performance gains are from the extra cores and faster processor speed and performance loses are from the slower eMMC. 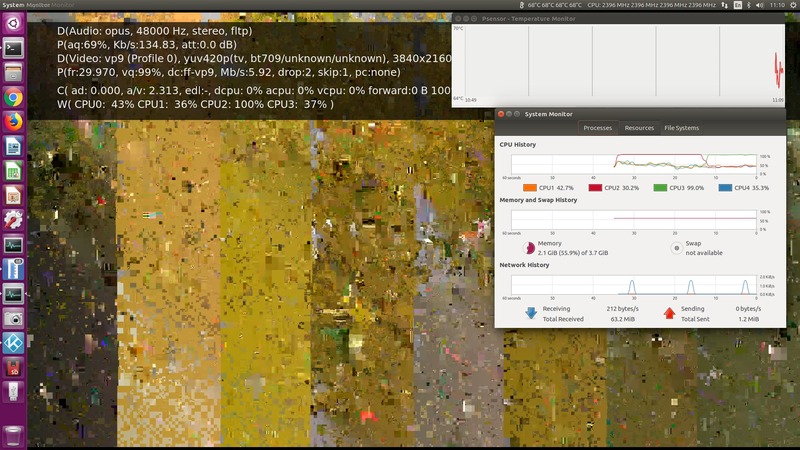 although on Chrome the [email protected] video had the occasional dropped frame which was unnoticeable. however [email protected] was fine with only the occasional unnoticeable dropped frame. 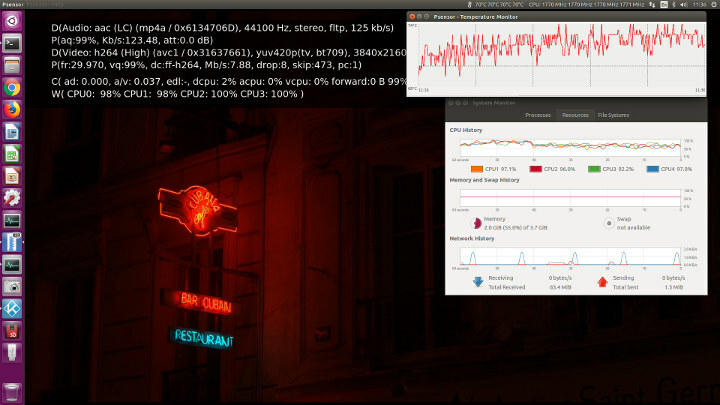 The results were unusual in that both Ethernet and 5.0 GHz wireless showed a very slow upload speed whereas for 2.4 GHz the upload was twice as fast as the download speed. 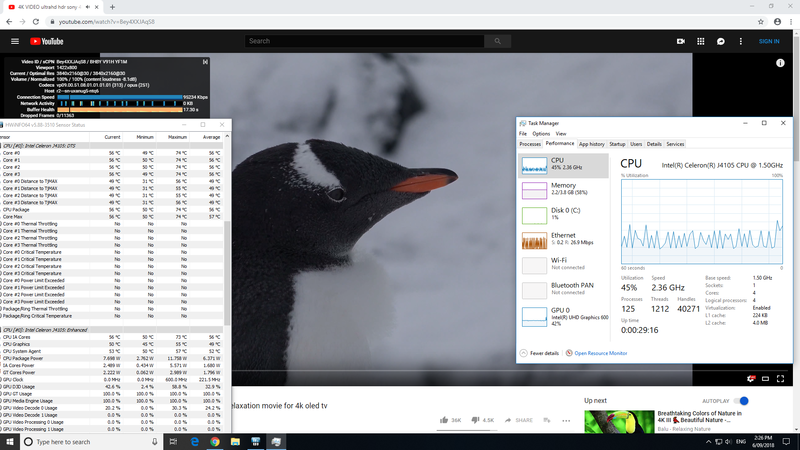 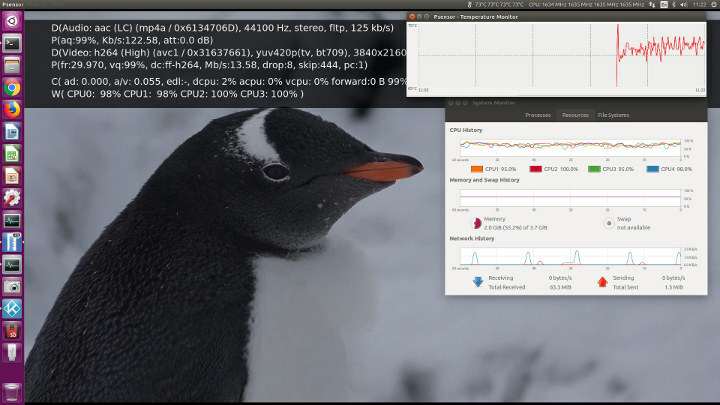 So I decided to repeat the entire testing using an Intel 180GB M.2 SSD housed in an SSD enclosure so I could directly compare the Beelink X45 with the NUC7CJYSAL, but this time using Ubuntu 18.04 LTS (18.04.1 ISO installed) to see if the performance under a later version of Kodi would improve. 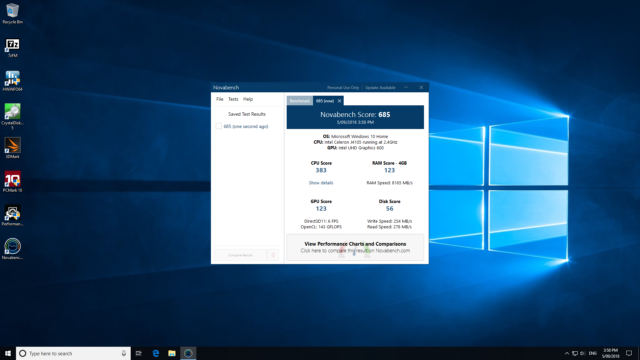 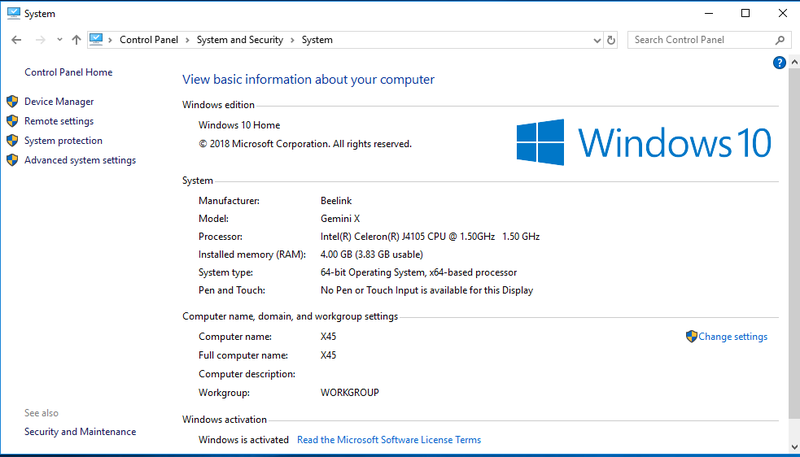 Windows was installed using the Microsoft ISO and all the necessary drivers were found and updated automatically with Windows activating immediately. 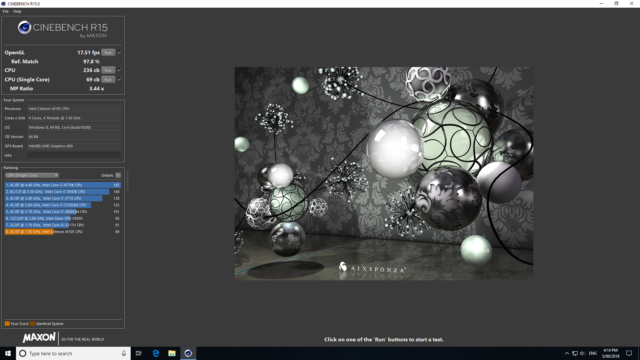 This time the CPU difference can be clearly seen and is reflected through slight performance improvements across all the results. 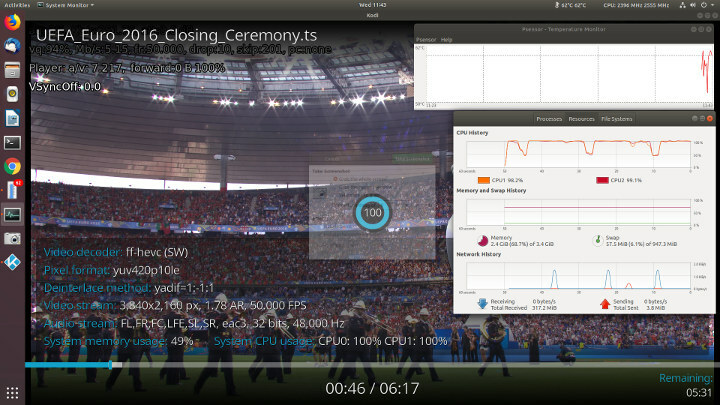 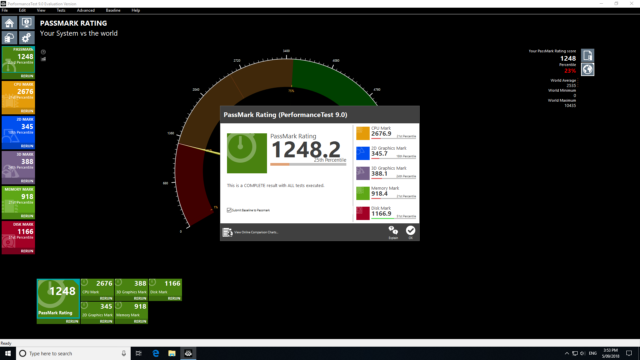 Again the results show the key performance gains from the extra cores and faster processor speed. 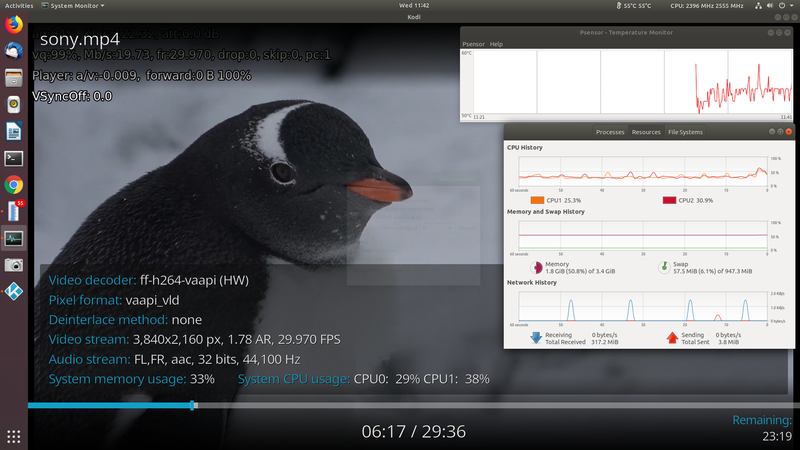 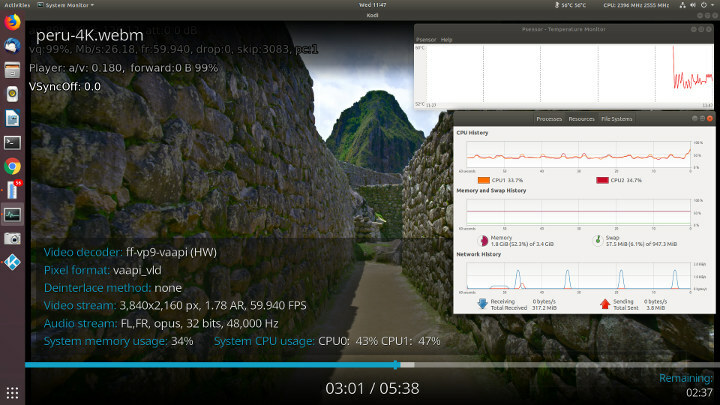 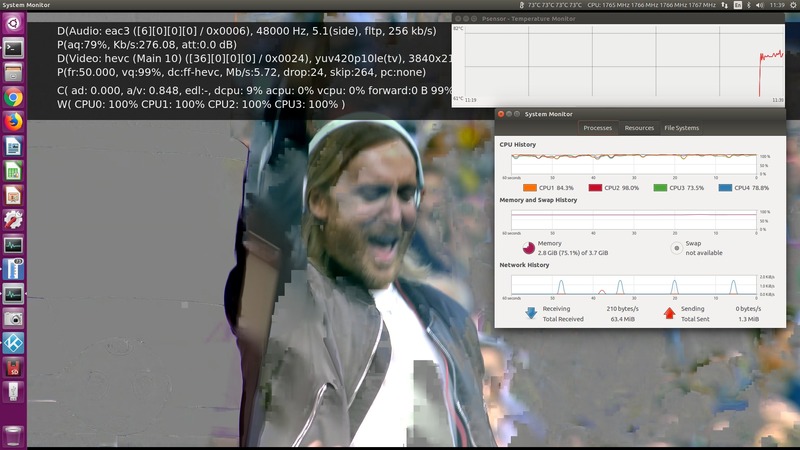 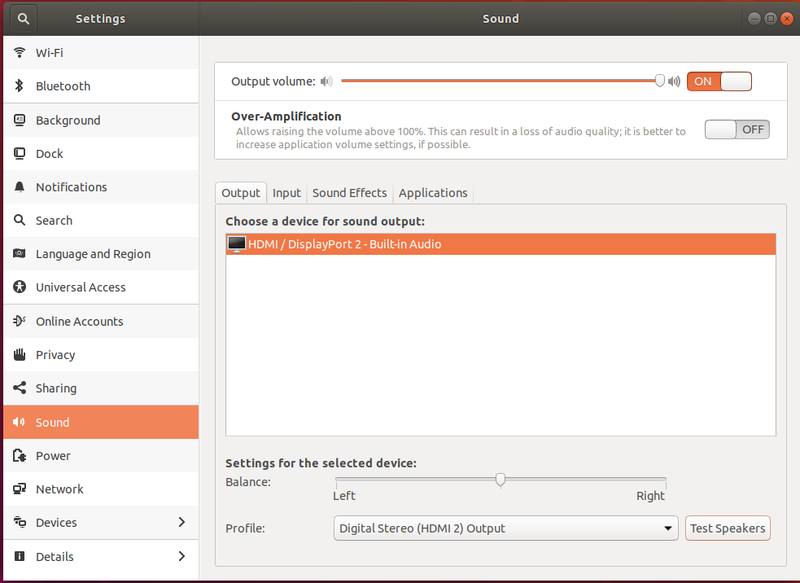 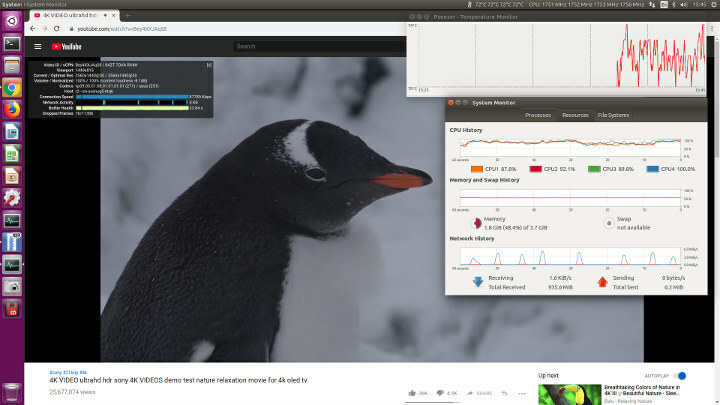 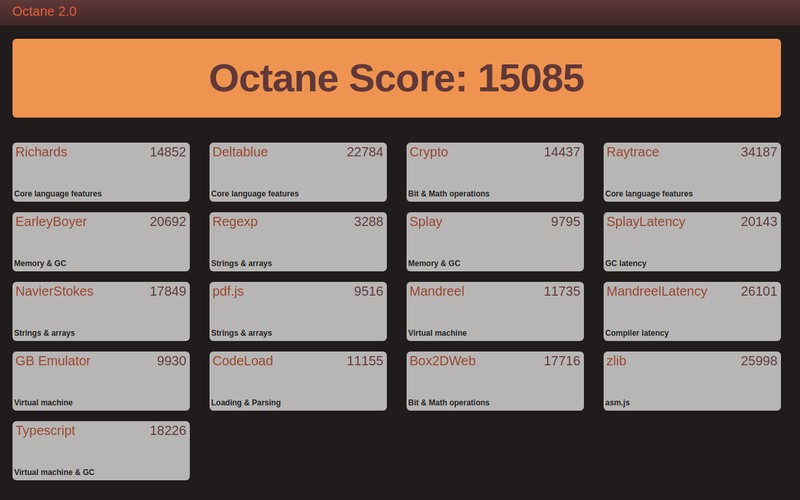 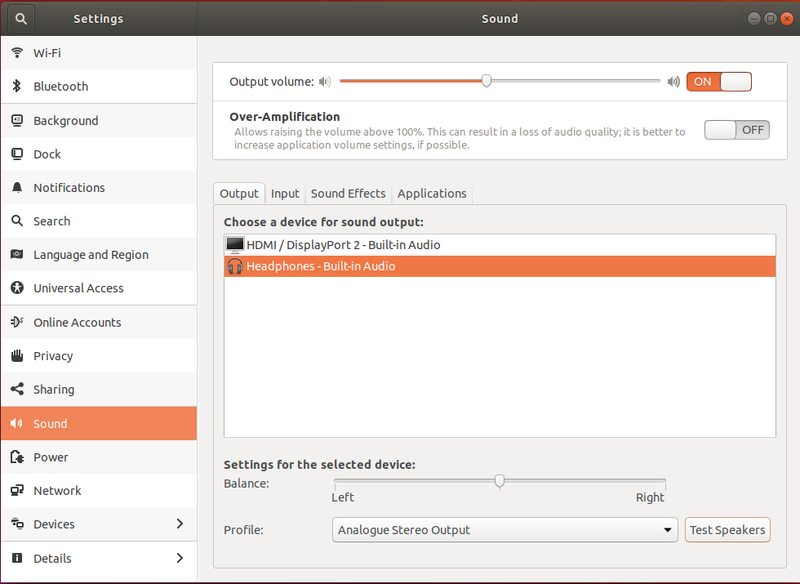 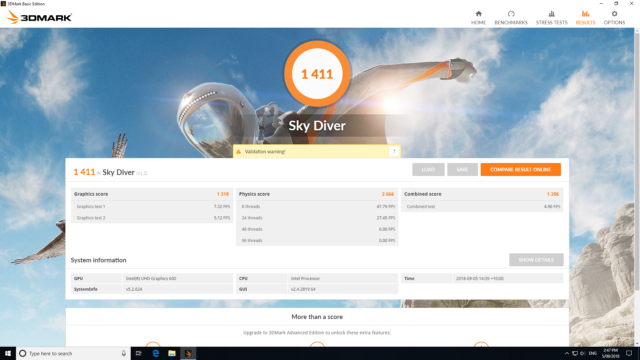 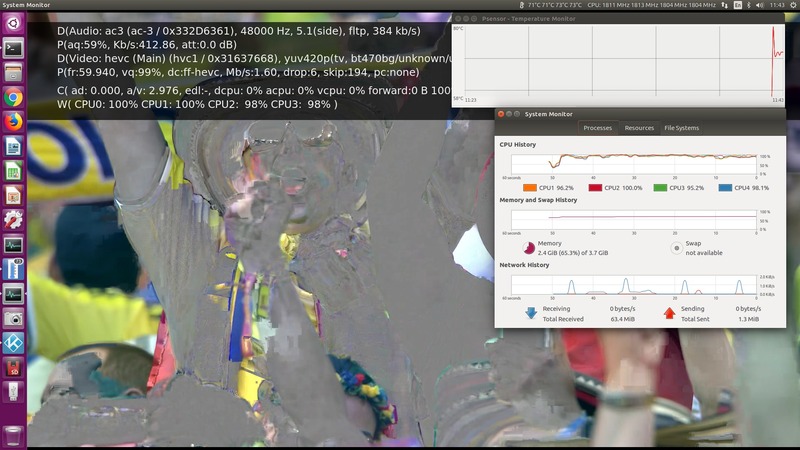 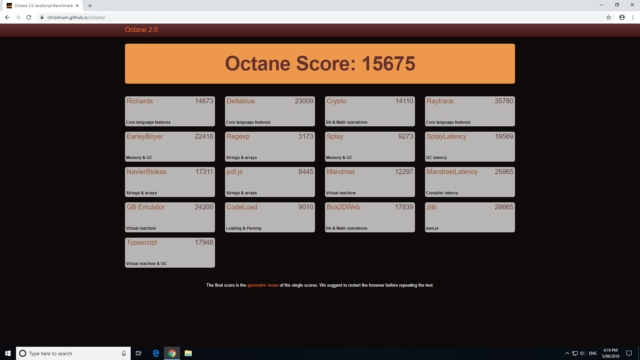 Ubuntu’s Octane result was also tested and it was slightly better (15958 for the Beelink X45 vs 15824 for the NUC7CJYSAL). The main improvement for both devices was through using the later release of Kodi on Ubuntu 18.04. 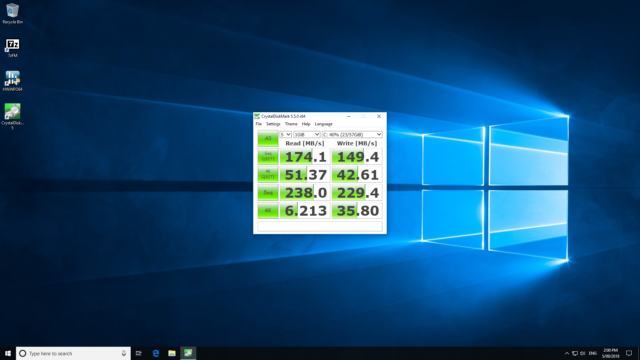 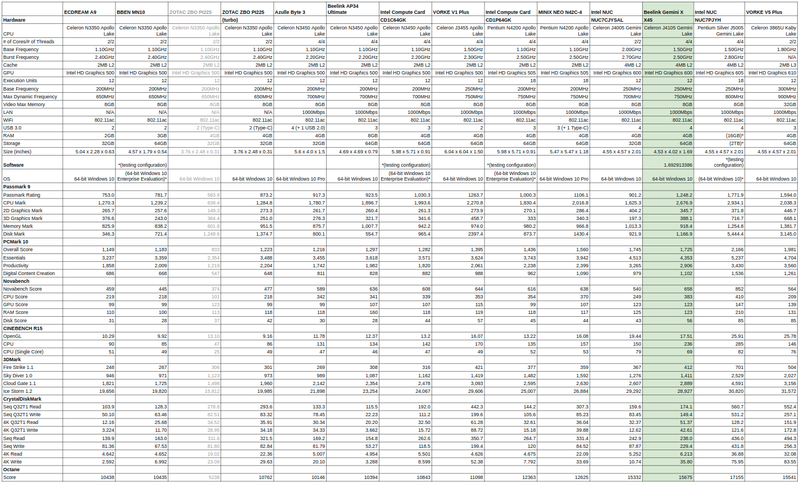 The results show a marked improvement for both Ethernet and 5.0 GHz wireless. 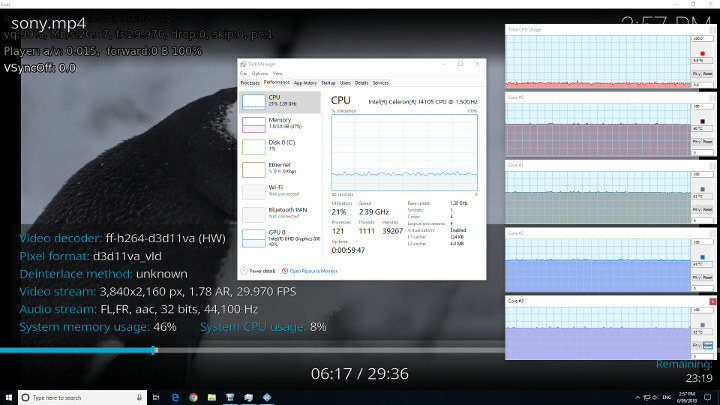 However it was impossible to connect to a 2.4 GHz network regardless of the router used. 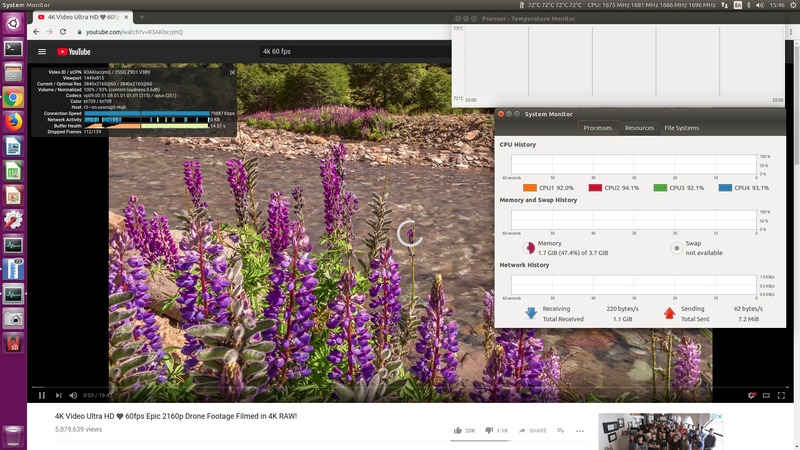 This indicates an software/driver issue rather than a hardware issue and will probably be fixed by a future Ubuntu 18.04 package upgrade. 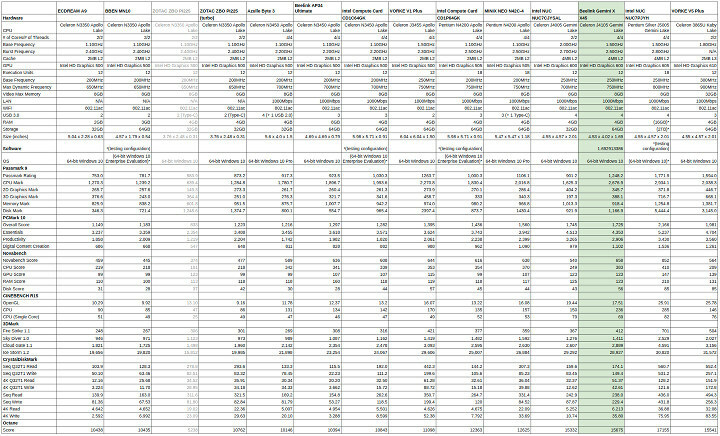 ** The power figures fluctuate so the value is the average of the median high and median low power readings. 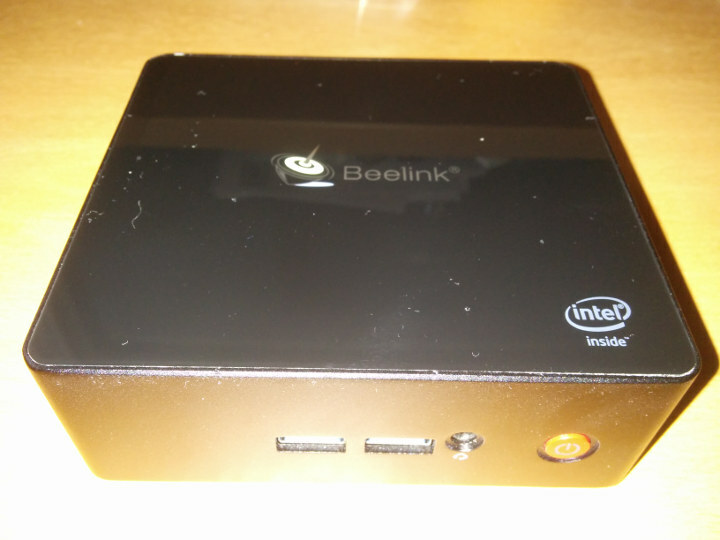 As shown the Beelink X45 is comparable to the NUC7YJYSAL. An advantage of the Beelink device is that it the storage is initially larger (64GB vs 32 GB) which means Windows updates without issue, and it is expendable not just with an SSD but also includes space for an mSATA. It is also slightly cheaper. 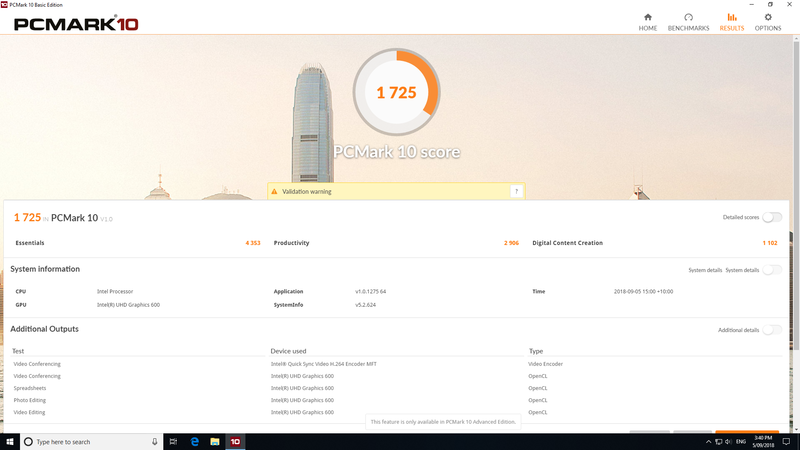 The disadvantage is that the memory is fixed at 4GB RAM and doesn’t come with a three (3) year warranty. 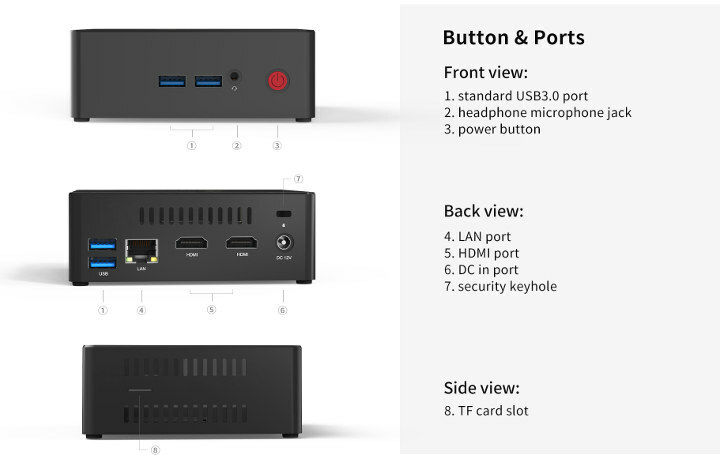 One minor point to also note is that the USB ports are very close together meaning if you have a physically large USB drive or a USB cable with a wide plastic end then you may effectively only have two rather than four ports. 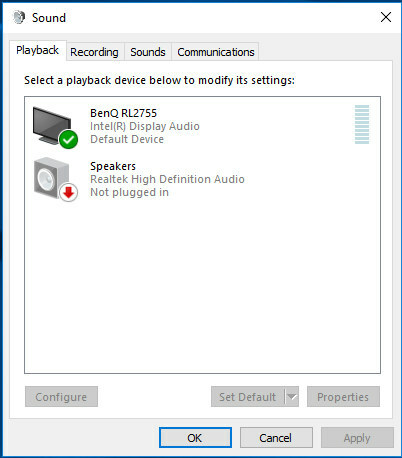 The front right-hand USB port is also very close to the headphone jack again meaning size interference may occur. 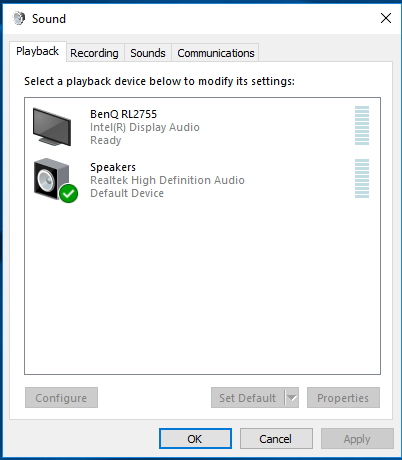 Overall the device performs well and is worthy of consideration and Lightinthebox are currently selling the Beelink X45 for $184.99. If installing Ubuntu I’d recommend only considering the 18.04 LTS release to ensure the latest version of drivers and packages like Kodi. 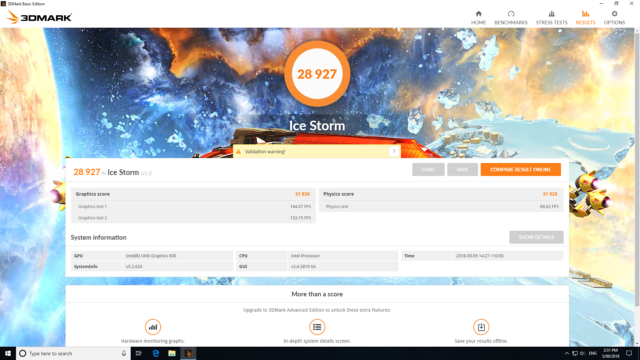 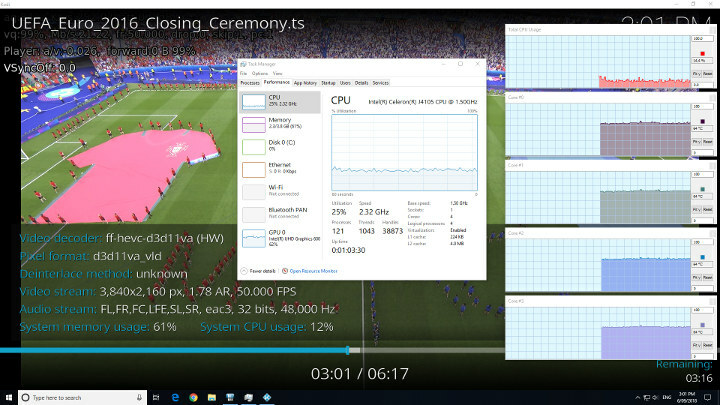 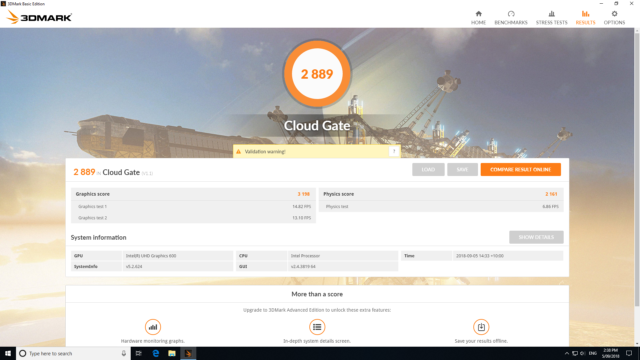 Not sure anyone cares but I noticed the RAM is reported as 2133Mhz instead of the advertised 2400Mhz and also it seems to be running in single channel only. 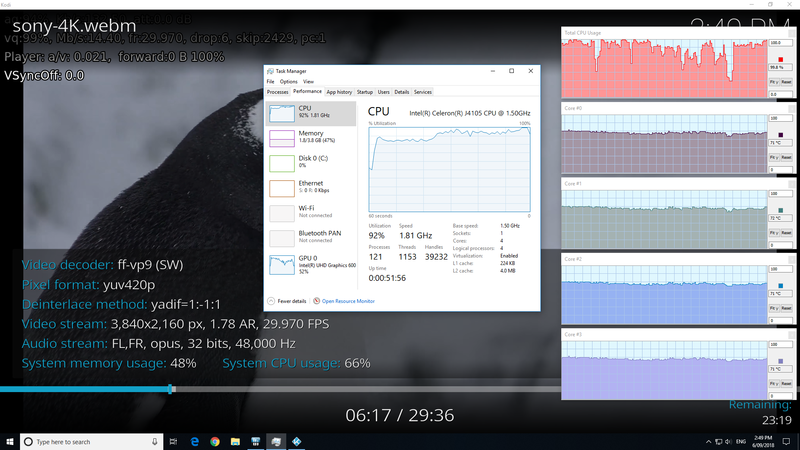 I wonder how much that affected the benchmarks and video tests? Also, anyone else see the NVMe entry in the BIOS and wished they squeezed in an M.2 2280 slot?